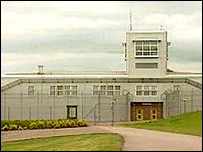 Parc Prison in Bridgend has been rated the worst performing privately-run prison in Wales and England. A report published by the Independent Monitoring Board (IMB) for prisons also found that there was a lack of separate health-care facilities for juveniles, and issues of staff morale. The research was carried out over a period of 12 months, ending in February this year. In response, the prison said that things had improved since then. The prison, run by Securicor, provides over 1,000 places for adults, young offenders and non-convicted juveniles. The report found that by the end of February 2004 it had fallen to 132nd place on HM Prison Service's performance standard weighted scorecard, thus making it the poorest performing privately-run prison in Wales and England. The research also highlighted a number of concerns which had been raised before. These included a "repeated failure to fill the 28-bed Juvenile Remand Unit", and the "continuing inability to meet certain contractual requirements." The "failure" to provide separate healthcare facilities for juveniles was also pointed out, as were the "totally inadequate level of dental provision" and "issues" of staff morale. In addition, the report found that there were seven outstanding inquests into deaths in custody at the prison. These dated back, it said, as far as 21 September 2002 and included the final inquest into the death in custody of a 17-year-old trainee found dead in his cell on 6 October 2002. In response to the findings, Paula Bateman from Securicor said that the drop in performance recorded in the report was due to an escape. "During that period of performance and since that time Parc is now ranked as 73 out of 134 prisons in England and Wales and the fourth highest private sector prison," she said. "The second point is that the population of the juvenile remand unit is not within the control of Securicor. "However we have now agreed with the youth justice board to alter the mix of the population to increase the occupancy. "It has now been agreed that HMP Parc will have a dedicated health care unit for juveniles housed at the prison," she added. "And finally the prison has recently changed its health care provider and we are pleased to say the dental provision is the same as normal NHS care. "The director has and will continue to work closely with the IMB to ensure that standards of care for prisoners and staff are maintained at the highest levels."